About a week ago I reported Ohio Secretary of State (again) cancels existence of Cincinnati's Heimlich Institute; is the organization finally down for the count? Ironically, as a result of me posing that question to Deaconess Associations (the Cincinnati corporation that wholly owns the Institute), they re-upped with the state. Per my previous item, the recertification notice from the state was dated March 22, not this past month -- so Ms. Wiesman got that wrong. On the other hand, the Institute -- a 501(c)(3) nonprofit -- hasn't had any employees since 2005 when it became nothing but a website. And as of 2015 the organization had zero assets, so presumably no one's minding the store. In flusher years, the Institute was the focus of investigations by the CDC, FDA, and the Justice Department for overseeing and funding notorious offshore experiments in which US and foreign patients suffering from Lyme Disease and AIDS were infected with malaria. 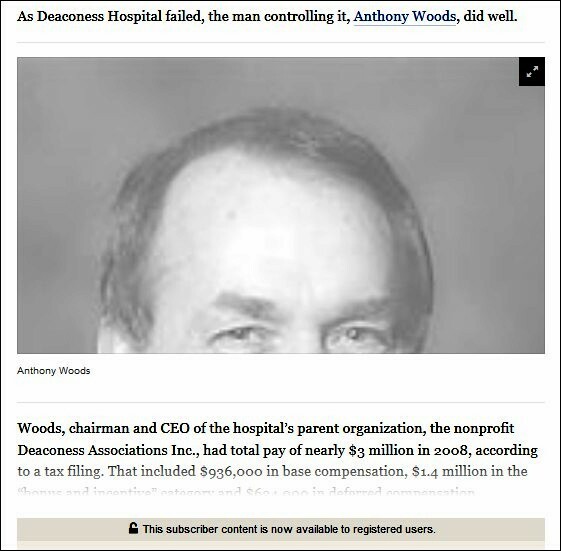 The "research" was paid for by hundreds of thousands of dollars from funders including director Ron Howard, actors Jack Nicholson and Bette Midler -- and even Muhammad Ali..
During those years, Woods and my brother Phil Heimlich (a former elected official who was tossed from office in 2006 after a bi-partisan landslide) served on the board of the Institute. As of 2015, they still did. Despite considerable related reporting (much of it based on research by my wife Karen and me), to my knowledge, neither Woods nor Phil have ever been asked by reporters about their knowledge and roles in the abusive experiments which bioethics experts have called medical "atrocities." 1) Are you able to provide me with the current assets of the Heimlich Institute (HI)? Per my blog item, the most recent IRS 990 (2015) shows bupkis. 2) Who are the current members of the HI board? 3) My understanding is that the HI has no employees. Is that accurate? If so, in what year did the organization last have employees? 4) My understanding is that the HI is currently an IRS-approved 501(c)(3) nonprofit. Is that accurate? Peter: Not at liberty to disclose this information. Now that it's a shell of an organization, should the Heimlich Institute still be entitled to 501(c)(3) nonprofit status? I'll ask the IRS and will report the results.